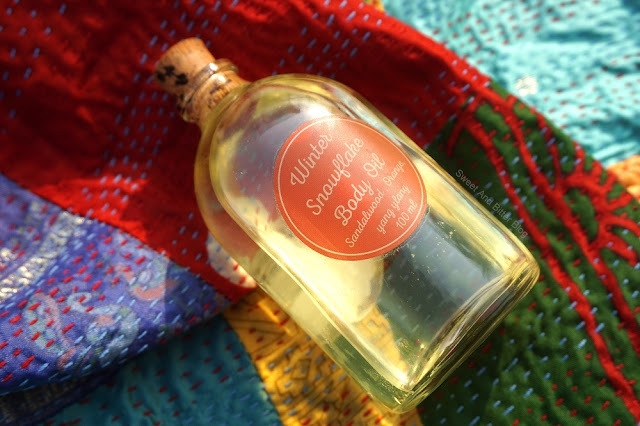 Do you use body oils? If you don't then please start using them. You skin deserve the massage and love. Petroleum jelly based products which only adds a top shield to stop moisture from escaping and the other cream products seep in but not deep. Body Oil on the other hand, seals moisture are absorbed by the skin, increases elasticity and fades marks. Right after my evening shower (when I scrub off all dirt and pollution away), I use oils to massage in the goodness and seal the moisture. Unfortunately, the body oils available at stores are all full of mineral oils. The good ones are hard to find. To avoid all hassles, I will say that you buy almond oil and add essential oils of your choice. 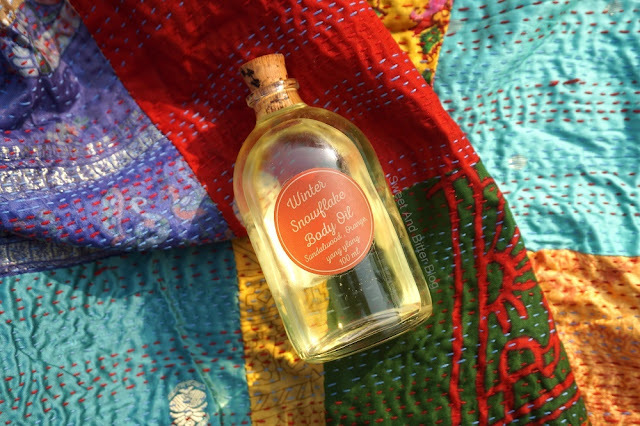 But, I love to try the new blends and last month I got to try a fantastic sandalwood oil blend - The Herb Boutique Winter Snowflake Body Oil. 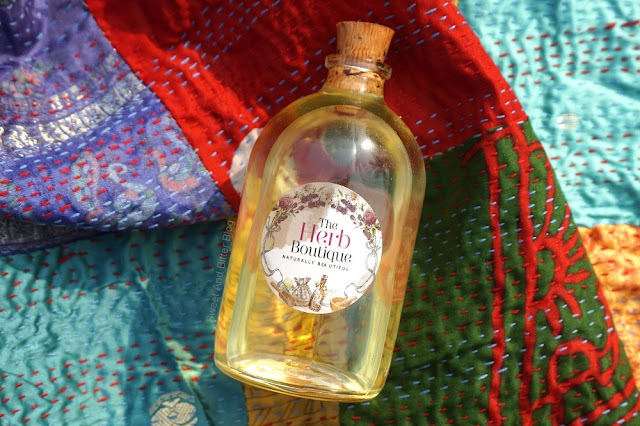 Availability: At The Herb Boutique online store. Ingredients: Sunflower Oil, Sandalwood Oil, Orange, Ylang Ylang, Vitamin E.
Fragrance: Full-bodied pure sandalwood aroma. It has a 'temple' feel to it. It smells as natural as it can get. Also, the smell is intense. 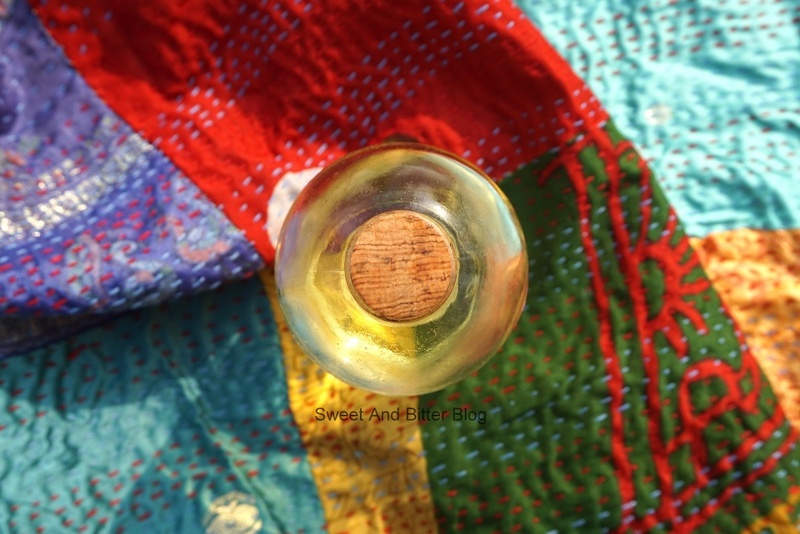 Packaging: Cute glass bottle with a wooden cork. Adorable? isn't it? No! It leaks. Even before I opened the seal, the oil leaked from inside of the bottle and damaged the label. I transfer it another bottle and then use it. I think they need to improve on this point. Full body sandalwood aroma to clears your mind. Price is almost as high as the high-end brands. The bottle needs improvement. while the cute bottle is the reason I picked it in the first place, I won't repurchase it for the same bottle. The ingredients are mentioned as 'Key Ingredients'. I don't doubt the presence of adulteration* but at least that would have given me peace of mind. Overall: I love the Winter Snowflake body oil. As a bottle oil and for its fragrance, I cannot find one bad thing. If you love Mysore Sandalwood Soap or Sandalwood Insense sticks or Sandalwood in general then do try it. Sandalwood is a highly appreciated ingredient for its long list of benefits for the skin. Plus, it has Sunflower Oil, Orange, and Ylang Ylang. Whoever created this deserves a pat on their back. The packaging and branding division needs some improvement at The Herb Boutique. Even the spelling of Ylang Ylang is incorrect on the bottle label as well as the website. *I wear socks at night to help the oil seep deep into my feet and not get rubbed off on my blankets. If I use any oils which are adulterated with vegetable oils, they start to smell of rancidified oils.